Nokia 6600 can be one of the best Nokia mobile phone in the media from 2003 to 2004. Worth it when greatness Conference name a new product, complete with a selection of design alternatives that promise. Nokia 6600 re-release with new design that is Nokia 6600 Fold. Although the name has almost the same, the Nokia 6600 Fold is a different product. Not only on the design of folding its course, more than that this product offers some new things. Not as a business phone like a mobile phone Nokia was number 6, but as one of the mobile phone fashion alternative. Strategy which I strange. Given that Nokia still has a fashion product that ber prefix number 7 and Supernova. And when viewed from the features provided, Nokia 6600 Fold also can not be spelled out in the mobile phone business with dressing fashion. Because, not many features office provided. Unless the 3G network that may be used to send a document file. 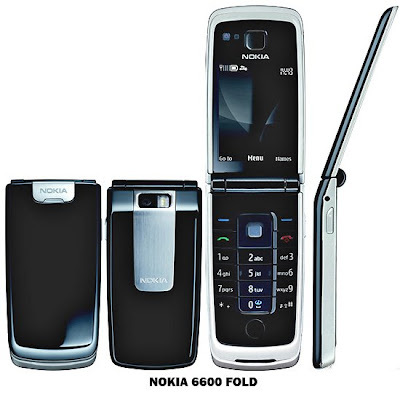 Appropriate name, the Nokia 6600 Fold folding design or have us call ordinary clamshell. Size does not fit so great in the clutch feel for the women. Some products CDMA Nokia has adopted the size and design such as this. However, not only in size only, interesting material that coat its role also gives the impression of sensual phone. Most of the mobile phone area coated by a transparent plastic material is smooth and glossy. Overview of the products we akan fashion old Sony Ericsson Z610. Including the use of the LED is hidden behind a layer is transparent. This is intended to change the external screen that is usually present in the product clamshell. Thus, when the phone is in standby condition, the fold will appear mulus 6600 without additional ornament. However, when touched twice or sms notification and incoming call, this section will bring a complete information through the LED. Open clamshell mechanism was close on a button placed on the side of the right phone. By pressing this button, the fold will open automatically. Positive we can only receive incoming calls with one hand, but we must be careful when we hand sweating and slippery, not a movement is not possible to open the flip phone would throw from the clutch. A most negative things that will be perceived when we realize there is no additional other button except the button on the opener flip phone. That is, when you intend to increase the volume of phone you have to vote bother pressing direction. Usually you live to press the volume key while you continue to talk with your opponent. Same as the Nokia 6600 Slide, this phone is also a product series 40 Nokia. No Symbian OS is used. Instead all the software delivered on a specific mechanism that does not utilize Java MIDP 2.0 environment is not ugly, but is considered less than the maximum. Moreover, when we find the slow acceleration of the software phone. For display, the Nokia 6600 Fold is still best in class. OLED 16.7 million colors with QVGA resolution and 2:13 inch diagonal. Because this product is a series 40 phone will also look the same with the other 40 series phones. As with mobile phone software support 40 new series, the display interface Nokia 6600 Fold look more dynamic. Menu today as a shortcut to some of the others are no longer displayed on the standby screen. On the one hand, this is positive because the channel into one menu, but also to be negative because the time needed for a menu that will be more specific. As a phone, the Nokia 6600 Fold does not only offer the course design. UMTS networks running on 2100 MHz frequency is also already there. Thus, almost all the 3G service operator can be used through the phone. Video call service is the first that can be enjoyed. Secondary VGA camera located on the top left into the main screen. But not all regions can enjoy, this is dependent on the 3g coverage of each operator. The next thing that you can enjoy a cruising range that is quite fast, the speed up to 384 kbps. With the Nokia browser, web page, wap and combination of both can be displayed properly. Not only that, the speed can also be used for access to Flickr, upload and download images to the site time. Trends of the present mobile phone is always to provide the music player with good quality. Expensive or cheap phone will race show as one of the features that seduce. Nokia 6600 Fold is also lagging. Luckily, with the Nokia music player, mobile phone fashion is the style. Support for some of the music file is not doubt. Similarly sorting file system that is good. All had been in one package the music player the Nokia 6600 Fold. As an alternative means of entertainment, there's FM radio. In addition to listening to most new music, we can also obtain the information up to date. Nokia 6600 Fold has a digital camera with 2 megapixel power. There is no autofocus on this phone. So also with the camera which is present in the new Nokia mobile phone. The result is not so disappointing, but not spelled out good. Results outside the room the image will produce a better picture when compared to in the space. Though this camera phone is equipped with an LSD lights flash, not enough help, especially if minimal light conditions. As an alternative we can still use it as a video recorder. Quality is quite good, because it is able to record VGA resolution video at speeds of 15 fps. Meanwhile, if the resolution of a QVGA zooming in, the recording speed can reach 30 fps. Facilities include a data cable connection microUSB and Bluetooth version 2.0 has been prepared to send a file throw. Either from phone to phone or computer to the device. Even with a complete profile, Bluetooth can also be used to listen to the music files with a compatible headset. Nokia 6600 Fold using battery BL-4CT is a Lithium Ion battery with a capacity of 860 mAh. Given the many features that do not require large resources, the capacity is sufficient. In one charging Nokia 6600 Fold can survive as long as 1.5 to 2 hours. That also can be decreased if the music player and 3G more intents. Nokia 6600 Fold bring the concept of sensual material with glossy Clamshell form and make it popular for women or anyone who want to impress on the glamor Nokia product. Unfortunately, the slow acceleration software and lack some of the camera, volume buttons Folding mechanism to leave the problem will be obstacles. So the price is also a matter of a problem because we only get a 3G phone with a humorous design.